It’s coming folks, yes January an on is going to be super clean, healthy, feel good, like really, really good recipes. 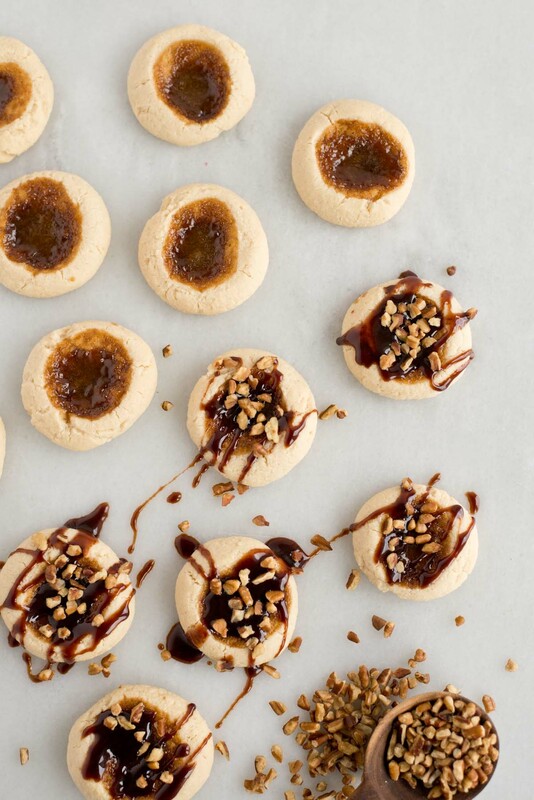 But for now, we must survive one more cookie, these turtle thumbprint cookies to be exact. Yes, yes I know you are all chuckling on the other side and I know just what you are thinking, that’s all the flavor. And sure enough there is no arguing that, but what I can assure you is that this cookie recipe has big flavor too but without all the bloat, kicking you off the sugar roller-coaster and into the lazy river. The better news is these babies are refined sugar-free. Which isn’t an excuse for binging, but rather a reason to ditch the guilty feelings and enjoy if you are going to eat a cookie anyways. 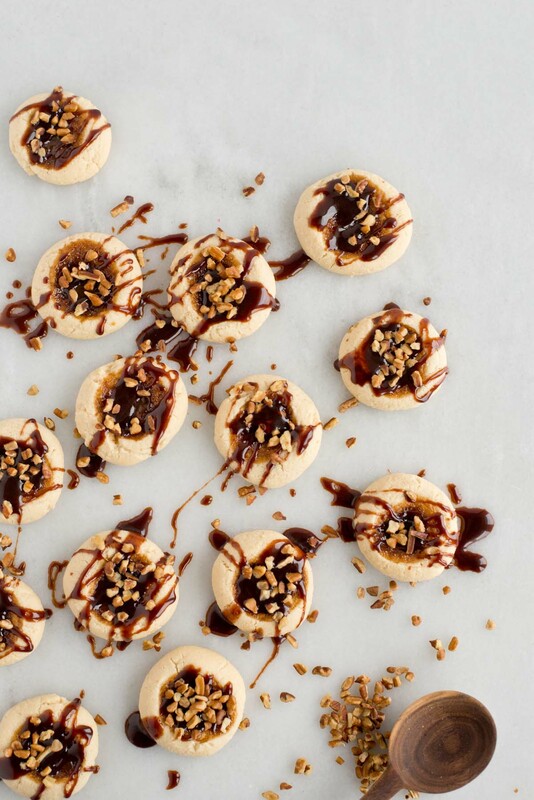 Not to mention your friends, co-workers and family members may be just slightly impressed with these turtle thumbprint cookies. 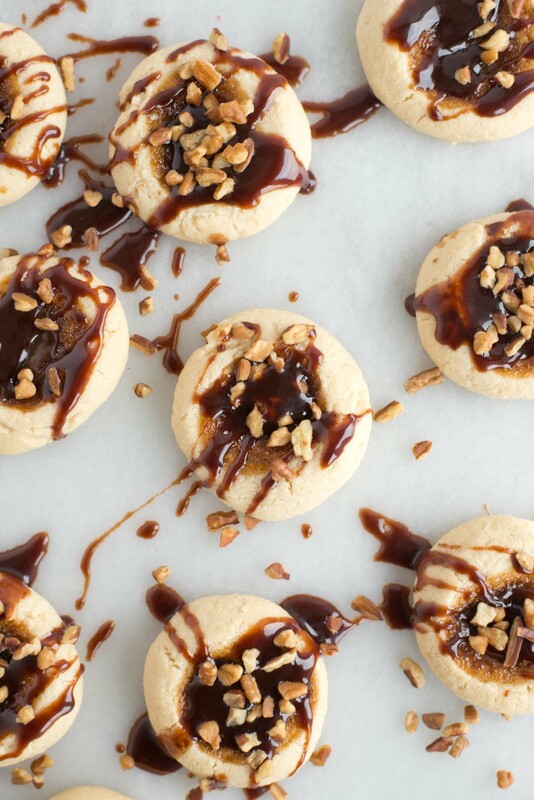 But who wouldn’t be with a chewy cookie filled with thick caramel sauce, drizzled in chocolate sauce and sprinkled with nuts? It’s time to roll up those sleeves, get the saucepan out because you only have one job to do. 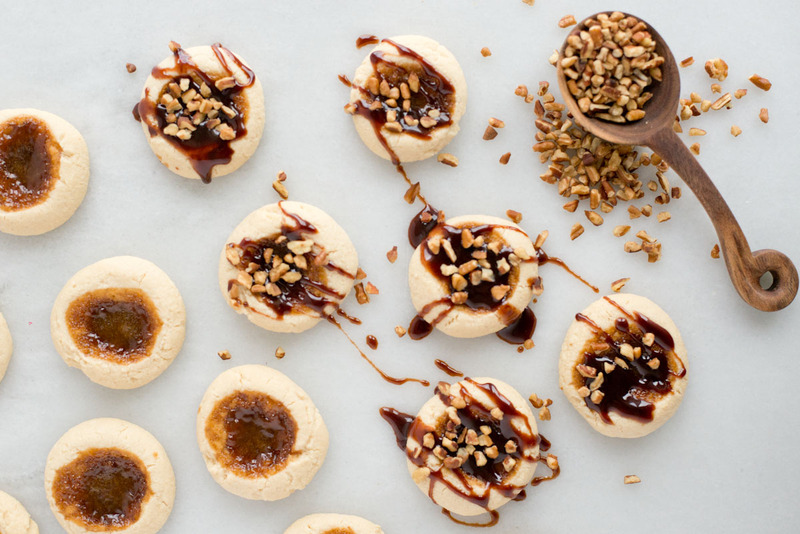 Turn up the music and start mixing up a batch of these turtle thumbprint cookies. Just to clarify, I am not enabling you to binge or overeat, mkay? I’m simply providing you with a healthier alternative to cookies if you were already going to eat them in the beginning. Just so we’re clear as glass on that topic and of course before we start to get into all things clean eating. Don’t worry the recipes will still have a lot of bang, even if I can’t promise to package them up in cookies. But wouldn’t that be something, the first cookie cleanse? Yep, this is going downhill fast. I must get my mind out of the cookie-gutter and get back to more important things… like that coconut milk caramel sauce…. 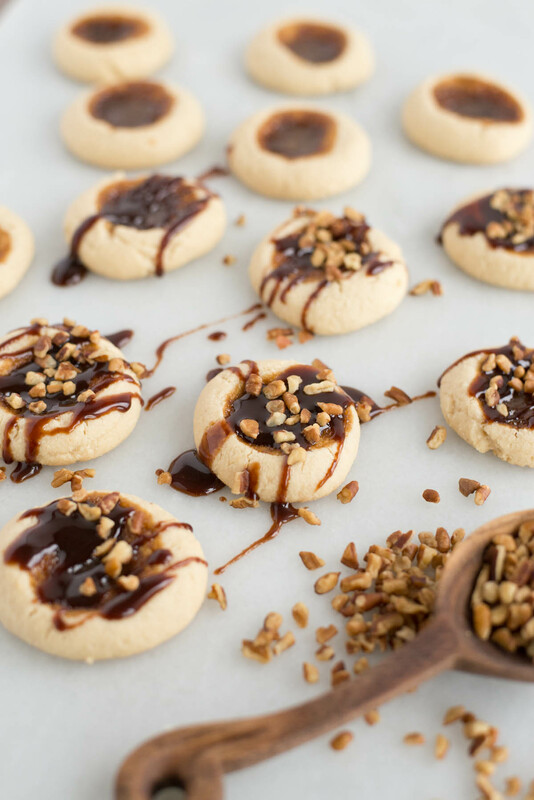 That caramel sauce does make me think of one thing, have you check out my FREE Sugar Substitutes guide? You’ll want to make sure and grab it before it’s gone. 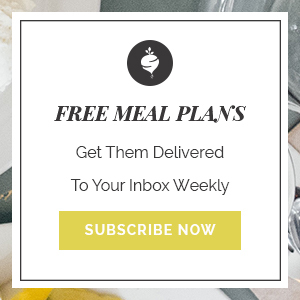 It contains the ONLY sugars I use, why I use them, plus an free exclusive recipe (think chai spiced cookies with creamy frosting). You’ll want to grab it and make sure you print that cheat sheet on converting traditional sugars with healthier ones. 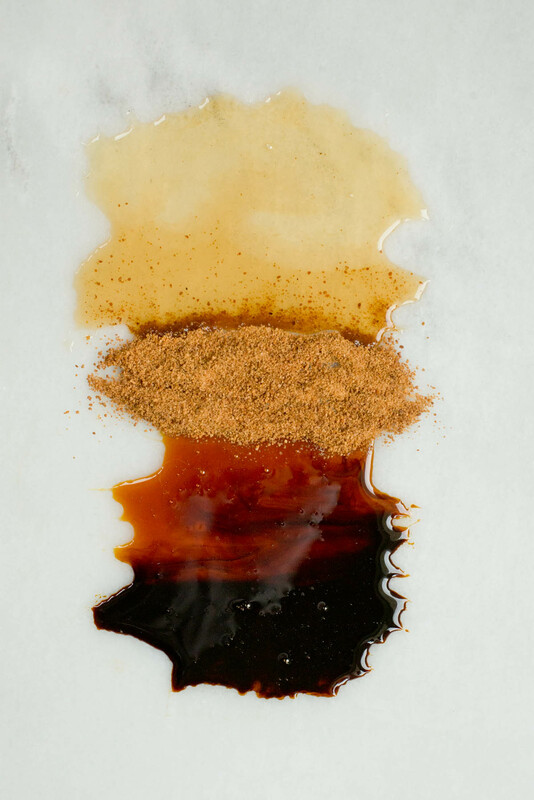 You’ll be impressed at how little sugar you’ll need to use in some of the recipes to get the same big flavor. Grab it here! In the meantime, I’ll leave you with one more look at these beaut’s…. P.S. T-minus 11 days until Christmas. Did I tell you I have a really BIG Christmas surprise for you all? Ahhh, you’re going to love it and it may mean one big Christmas Gift for one of you! Stay-tuned, it’s coming, but first up it’s all things breakfast. Make caramel sauce according to directions and boil until thick and syrupy. Let cool. Mix almond flour, arrowroot powder, and salt together in a medium bowl. Add in vanilla extract, maple syrup and melted coconut oil. Mix until a soft dough forms. Scoop 1-2 Tsp of dough into your hands and roll into a ball. Push your finger ¾ of the way through the center. Place on baking sheet. 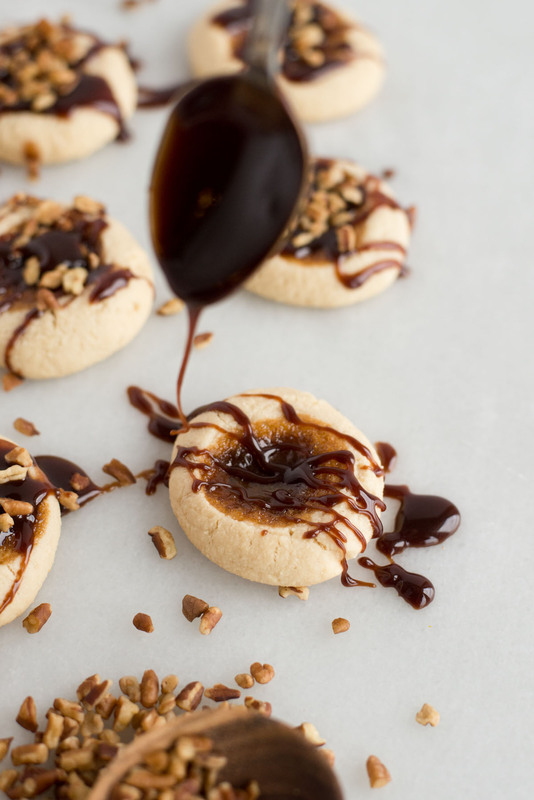 Fill each center with enough caramel to come to the top. Bake for 20 minutes and place on cooling rack. Once cool, drizzled with melted chocolate and sprinkle with nuts.